no thank you bite | Mother of the Year... AGAIN! 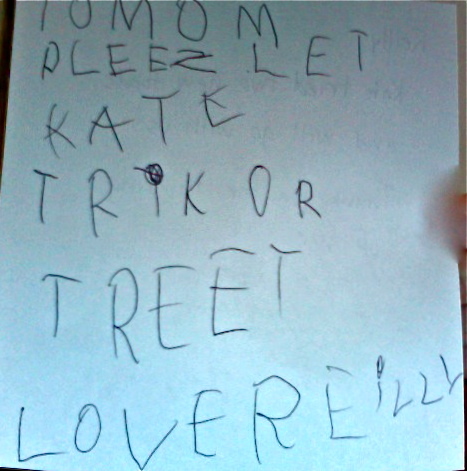 Well, thankfully, with the help from some friends (okay and some professionals), we have figured out a way to work with the poor choice/threat I made for Kate regarding her “no thank you bite” and “trick or treating”. After trying two new things, unknowingly, and of her choice, we told her that it was great that she tried (apple cider and a peanut butter, jelly and cheese sandwich – NOTE: these were her requests, not mine) new foods and she could go trick or treating with us. Hey, as hokey as it is, it was so DUMB of me (I hear Reilly in my head right now saying “bad word Mom, that’s not nice”) to put something in front of her that I wasn’t willing to do AND that was so huge that she wanted to make her own choice and be in control. Anyway, lesson learned, at least for me! Her VERY thoughtful brother just pushed this note under my door, I though you might like to see it. Kate had a tough time at dinner. She was testing the “No Thank You” bite clause. She is a stubborn one and has a mind of her own. 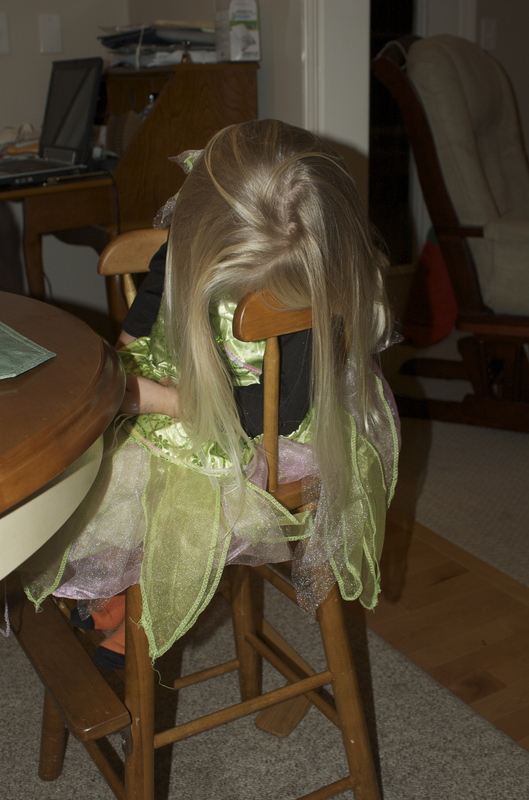 Here, dressed as Tinkerbell, long before bedtime, her fatigue got the best of her and she just passed out.